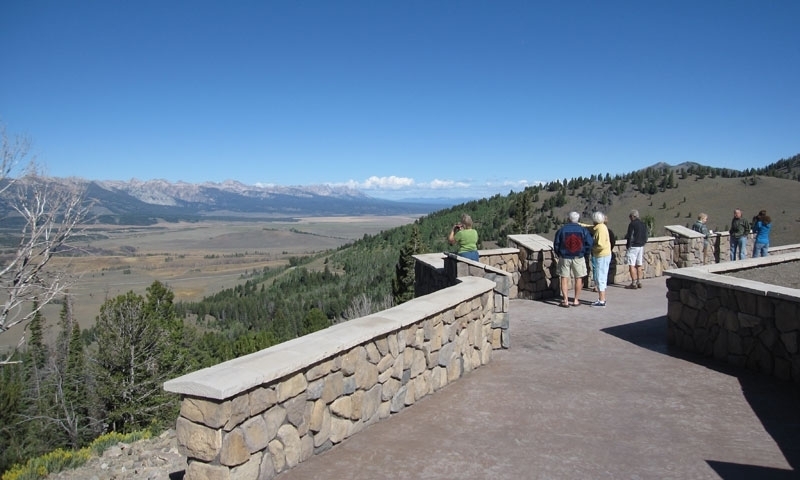 Previously known as the Galena Summit Overlook, this roadside vista point on Highway 75, just one mile north of the Summit of Galena Pass, was renamed the Bethine and Frank Church Overlook. The Galena Summit Overlook is now known as the Bethine and Frank Church Overlook. The Overlook is located 30 miles north of Ketchum on Highway 75. At a height of 8,701 feet, the Summit offers spectacular scenery as you gaze out over the Sawtooth Mountains and Sawtooth Valley. From this vista, the entire Sawtooth Valley stretches out before you. This is a great place to take a break, stretch your legs and enjoy the view. At a height of 8,701 feet, the Summit offers spectacular scenery as you gaze out over the Sawtooth Mountains and Sawtooth Valley. The Sawtooth Valley is nearly fifteen miles wide and thirty miles long and is the location of the headwaters of the Salmon River. From here the Salmon River travels over 900 miles to end its journey at the Pacific Ocean. Galena Summit Overlook, now known as the Bethine and Frank Church Overlook, is 30 miles north of Ketchum, Idaho on Highway 75. Galena Summit Overlook is accessible year round. The first road over the summit was built in 1881 to provide a passage for supplies to mines located at Vienna and Sawtooth City. These cities are now ghost towns. A part of the old road is still visible. This is one of the most frequent visited venues in the State of Idaho.